In this post, I am going to explain why I own shares of China Ceramics Co., Ltd. and why I think China Ceramics represents an excellent opportunity to double your money over the next year. China Ceramics trades as CCLT.F or CCLTF for some brokers, and as CCLT.E or CCLTE at other brokers. Before getting into the details, I’ll summarize the investment thesis. China Ceramics operates a simple business that has been growing well over the past several years. Earnings grew 10% last year and has grown an average of 27% annually over the past 3 years. Unlike many other Chinese companies, it does not use aggressive accounting to inflate its earnings – when looking at its cash flow statement, one can see that the business generates equivalent amounts of cash flow from operations as its net income. As well, the Company uses Grant Thornton, a top 5 accounting firm, as its auditor, unlike most other Chinese smallcaps. Despite having (i) a simple, understandable business, (ii) high revenue, net income and cash flow growth, and (iii) a top-tier audit firm, the company trades at extremely low valuation multiples. Specifically, it trades at 3.9x P/E and 3.7x 2010 forward P/E, assuming a share price of $8.50. From an EV / EBITDA perspective, the company trades at 2.1x EV/EBITDA. I think that these valuation multiples are much too low, and later in this article I’ll provide two analyses to demonstrate that. 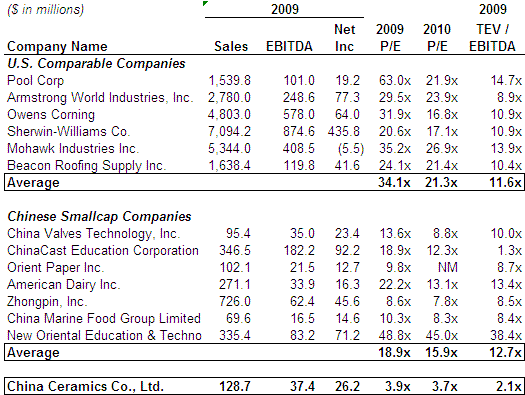 First, I’ll compare China Ceramics’ valuation multiples to other U.S.-listed Chinese smallcaps. Second, I’ll compare China Ceramics’ multiples to comparable American companies that operate similar businesses. Why does this opportunity exist? I have two reasons. First, China Ceramics became a public company by merging with a Special Purpose Acquisition Company, also called a “SPAC”. SPAC transactions are complicated, and it’s difficult for the average investor to determine the capital structure and valuation that resulted when China Ceramics went public via the SPAC. The correct earnings per share or P/E ratio does not show up on Bloomberg, Capital IQ or Yahoo Finance. There is no sellside coverage yet, so investors cannot refer to research reports. An investor must pore through a 300-page proxy in order to get the correct information and even then, an analyst must do a sophisticated set of calculations to deduce the correct valuation. One document where the numbers are clearly laid out is the Company’s recent investor presentation, which is linked here: http://www.megaupload.com/?d=557XJU8E. In a year’s time, this information will be much more clear for everyone to see. The Company will have SEC annual and quarterly reports with the SEC, and the low valuation multiple will become obviously apparent for anyone that picks up their SEC filings. By then, I think that the stock price will be double the current value, as investors begin to realize how surprisingly cheap China Ceramics currently is. Second, China Ceramics is listed on the OTCBB, because like many other newly acquired SPAC targets, it does not initially have a sufficient number of shareholders to meet the exchanges’ minimum shareholders requirement. I expect that issue to be resolved shortly, after which China Ceramics will be listed on a regular exchange. There are numerous SPAC companies that spent approximately 6 months on the OTCBB before becoming listed on an exchange, including WWAY, CHOP, etc. The company’s current status on the OTCBB presents investors an excellent opportunity to become involved prior to an uplisting. An exchange listing will result in more liquidity for the shares, which should translate to a higher valuation multiple. China Ceramics is a Chinese manufacturer of ceramic tiles used for exterior siding and for interior flooring and design in residential and commercial buildings. The ceramic tiles, sold under the “HD” or “Hengda” brand are available in over two thousand styles, colors and size combinations. The market for Hengda’s products has been growing due to the increasing demand for construction materials in the PRC attributable to population growth, population urbanization and an increasing standard of living. Note that China Ceramics has been helped by the Chinese real estate boom, and earnings are at risk if that boom turns to bust. Despite that, the current valuation is too low even accounting for that potential risk. The Company’s manufacturing facility is located in Jinjiang, Fujian Province with an aggregate annual production capacity of approximately 28 million square meters. In Q4 2009, the Company acquired a new facility in Gaoan, Jiangxi Province. The 12 production lines in Gaoan are expected to increase Hengda’s production capacity by 42 million square meters to a total of 70 million square meters in 2012. The company has long-term relationships with its customers and nine of its top ten clients in 2008 have been purchasing from the company for over nine years. Let’s look at its financial trends. Below are revenue, EBITDA and net income, translated into U.S. dollars, for the past 4 years. As we can see, the company has grown revenue, profitability and cash flow consistently over the past four years. Net income margins have remained above 20% during this time, and although growth slowed down in 2009, it still remained at an impressive 15%. As well, note the comparability of net income and cash flow. Unlike other Chinese companies (see FUQI, for instance), the company’s profits are not an accounting fiction, but instead directly translate to increased cash for shareholders. In our valuation discussion, we are going to assume a share price of $8.50. The stock has traded in a range of approximately $7.50 to $9.00 over the past month. The share counts are laid out on page 22 of http://www.megaupload.com/?d=557XJU8E. The base share count is 9.0mm shares. Then, there are two variables that alter the share count. First, certain shares are released to the sellers if the Company meets certain earnings targets. Second, there are warrants outstanding, which dilute the share count depending on the trading value of the stock. We’re going to assume that all earnout shares are released, to be conservative. Next, using $8.50 as our share price, we have additional shares of 1.8mm due to warrant dilution, using the treasury method. This results in a total of 12.0mm shares in 2009; 13.8mm shares in 2010 and 15.9mm shares in 2011. The resulting market capitalization of the company, at an $8.50 stock price, is $94mm in 2009, $117mm in 2010 and $135mm in 2011. Net income in 2009 was $26mm. So, using trailing multiples, the company trades at a P/E ratio of 3.9x. If the company meets its earnings targets for 2010 of $31.4mm and 2011 of $39.1, it would trade at 3.7 P/E and 3.5 P/E. If Net Income for some reason drops to $25mm, then the escrow shares will not be released and the resulting 2010 and 2011 P/E ratios would be 4.0x. However you look at it, this company trades at very low valuations, especially considering the company’s operational performance, strong cash flow and top-notch auditor. The earnouts are structured well to incentivize management, but not penalize current shareholders. Whether or not the company meets its earnout targets, current shareholders are purchasing China Ceramics equity at low P/E multiples and high free cash flow yields. A more appropriate P/E ratio for this business would be greater than 10x P/E. At that price, the stock would be trading at $14+, more than a 60% gain on the current share price. Again, to best understand the potential stock price at different P/E ratios, I would look at slide 22 of the attached presentation on http://www.megaupload.com/?d=557XJU8E. One way to see how China Ceramics is undervalued is to compare it to comparable companies. In the below chart, I show CCLTF's multiple compared with comparable American companies, as well as other Chinese smallcaps. As a final point, I will add that the company’s board of directors includes reputable members, including Bill Stulginsky (a former Partner at PricewaterhouseCoopers LP) and Paul Kelly (Chairman of Knox & Co., an investment banking firm, and a member of the Board of Trustees at the University of Pennsylvania). The company has also made a concerted effort to be responsive to U.S. investors. The Company presented at the Rodman & Renshaw and Roth Capital Partners conferences in March. The chief financial officer has made several trips to the United States to meet with investors. The Company has been forthcoming with press releases announcing earnings and major business events, and hosts conference calls after its earnings announcements. The Company also hired CCG Investor Relations in February as its IR firm. CCG has a good track record of helping smallcap Chinese companies develop U.S. investor bases. 1. High top-line and bottom-line growth, with revenue and net income having both grown at a CAGR of 27% over the past four years. 2. High “earnings quality”, which means that its cash flow accurately matches income statement profitability. The company does not have irrationally high days sales outstanding, low inventory turns or high advances to suppliers. 3. Grant Thornton, an internationally recognized top 5 accounting firm, is its auditor. 4. The company is a leading operator in a simple business that benefits from China’s long-term growth prospects. 5. Its board of directors include reputable members, including a former Partner at PricewaterhouseCoopers LP and the Chairman of investment banking boutique Knox & Co. / a member of the Board of Trustees at the University of Pennsylvania. I think China Ceramics is a terrific investment and that an investor can make 100% returns over the next year by purchasing the stock at current prices. If an investor wants to take additional risk, the warrants also feature an attractive risk-reward profile, and an investor could potentially make several times his money on the warrants (note, however, that the levered nature of the warrants could result in larger downside as well - the stock is a more appropriate investment for conservative investors).